The latest iPad is a fantastic mobile device. It’s high-resolution Retina display, lightweight, and easy to use touch-screen interface make it a joy to use for almost any task that can take advantage of a touch-based interface. Although editing photos, reading e-books, surfing the web, or viewing movies are fantastic experiences on a tablet, there is one feature that leaves many people searching for an alternate solution: the touch-screen keyboard. Using the on-screen keyboard can be a drag if you have to type for an extended period of time. Many people – especially accomplished typists – find the virtual keyboard too small. In addition, there is no tactile feedback when pressing individual keys like the familiar feel of keys on a physical keyboard. When the iPad was first introduced, Apple marketed a “keyboard dock” that incorporated a physical keyboard into a stand that held the iPad upright. After a while, Apple quietly discontinued the keyboard dock and left the development of keyboards to third parties. Over time, a number of companies have created keyboards for the iPad, many of which were integrated into a protective cover for the tablet. 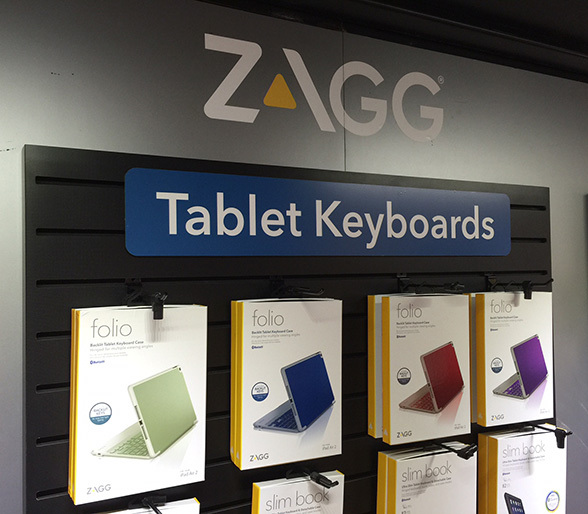 The ZAGG Folio is one of the latest generation of keyboard/cover combinations available for the iPad. We tested the keyboard with an iPad Air and were pleased with the overall performance, useful features, and increased productivity when compared to typing on the built-in touch screen keyboard.. Overall the ZAGG Folio seems well engineered with solid fit and finish. The case is constructed of durable plastic that feels comfortable in your hand. The plastic has a subtle “give” when inserting the iPad and the surface is not too smooth – a subtle texture makes the unit easy to hold. The molded cover hugs the iPad snugly while allowing the iPad to be inserted and removed easily without undue bending of the enclosure. We asked a number of accomplished typists to try the unit and all found the keyboard to have a nice responsive feel. The keys are similar in size and layout found on a typical Macintosh computer keyboard with a travel distance that is about the same as well. One of the best selling points of the ZAGG Folio is the back-lit keyboard, which emits a light blue color from beneath the keys. A small key at the bottom of the keyboard allows the user to turn the backlighting on and off. In addition, the intensity of the light can be adjusted to three levels to meet ambient light conditions. The keyboard can be charged using the supplied micro USB cord that can be plugged into any standard USB charger or wall plug. It takes only an hour or so to charge the extremely robust battery, which under normal usage holds a charge for up to three months. In our test, this battery life claim holds up. You can extend the battery life by turning the keyboard off by using the easily accessible small switch in the right side. We often switched the unit off when we performed tasks that did not require a lot of typing. The case also is very useful as a stand for the iPad when viewing photos, watching movies, or reading content on the web. The tablet screen can be angled up to 45 degrees beyond vertical, which is fine for straight-on viewing when seated or lying down. Although the Folio is not a lightweight case – it about doubles the weight of the one-pound iPad, – it incorporates a lot of features that make it a worthwhile addition to the tablet. The closed case provides a secure protective enclosure when transporting the tablet. The ZAGG Folio comes in classic all black. There are useful reviews and discussion about the Zagg Folio on their site. They’ve also announced the Folio in four colors for the new iPad Air2: green, blue, red and purple. The color of the keyboard keys coordinates with the outer case color. The unit retails for $99 and the basic black model can be found online for as little as $65 if you shop around. It’s a great value for the feature set and the quality of protection it affords the iPad. Ray Gordon is a registered architect with a masters degree in City and Regional Planning. He has held a variety of professional positions in both the private and public sectors, with jobs ranging from managing an environmental sciences firm to art director with advertising agencies in Japan. In addition to work in architectural design, Ray is also a professional photographer, videographer, film editor, and graphic designer. He was a professor of architecture and urban design in the graduate programs at Pratt Institute for 17 years, and also taught the regulation of real estate at New York University’s graduate Real Estate Institute for a six year period, with an emphasis on environmental regulations. Ray has worked with computers for well over 30 years. Over the years, he developed a working knowledge of many types of software programs, from spreadsheets and data bases, to illustration and video editors - with hands-on experience on numerous computers and peripheral hardware as well. Ray's writing and photographs have been published and exhibited in both the USA as well as Japan (where he lived for 12 years). He authored the chapter on urban design for a recently published World Bank book, wrote the chapter on waterfront construction infrastructure in "Understanding Infrastructure," edited the Urban Design Review newsletter, and has contributed to a number of magazines on travel and design. Connect with Ray Gordon on Google+ and Twitter @RayJGordon.